APCO senior staff will address the vision for the future of emergency communications. The presenters will describe the best paths towards modernizing 9-1-1 and providing 9-1-1 professionals with the tools and resources they need to enhance emergency response. Hear from the practitioners – directors of 9-1-1 centers – on what they need to achieve the vision of an advanced, broadband-enabled, emergency communications solution. APCO Chief Technology Officer Jay English will lead a discussion with companies innovating solutions to provide and deliver broadband content to 9-1-1. 9-1-1 centers have always played a role as a “fusion center” through collection of information through disparate sources, vetting of information, and dissemination of relevant information to first responders. NG9-1-1 will bring a wealth of new information sources in the 9-1-1 centers. How that information will be ingested and digested within centers that are often already overtasked must be considered. Once evaluated, these relevant data sources must be pushed to the responders and incident managers. FirstNet will enable this critical piece. This session will examine the evolving role of the 9-1-1 center and how NG9-1-1 and FirstNet will enable these critical tasks. Hear from key policymakers discussing timely issues impacting the deployment of next generation services. Developments in 9-1-1 location technology are coming from multiple directions, with improvements consistently being made. Driven by consumer-focused technologies, federal regulations, and recent federal legislation, industry representatives will describe the trends impacting 9-1-1 location accuracy. 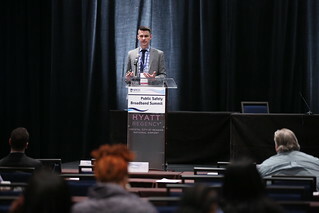 The Public Safety Communications Research Program is launching an exciting new developers contest that will run March – December 2019. The Challenge is titled “Tech To Protect” and will ask for solutions to 10 problems identified by the first responder community. Problems cover the full public safety community; police, fire, EMS, 911 and emergency management. We will discuss emerging technology and provide information on this unique, government-sponsored, open-innovation competition to create powerful software solutions for first responders. Attendees will learn how they can participate and provide input. APCO Chief Technology Officer Jay English will lead a discussion with companies innovating solutions to enable ECCs to share and exchange data with each other and with responders in the field including FirstNet users. The Internet of Things – or rather, Internet of Lifesaving Things – and social media offer new opportunities and challenges for ECCs.